There are 15+ layout styles for your easiness – no codes required to change your layout. It's just one click away. Make it specific columns, or change the width of your post. It's infinite. You can make it scroll infinitely with the built-in plugin, or make it paginate. Noir supports two different types of the 'load more' buttons too. You can fix the header, uppercase title texts, hide avatar, or resize your font. Noir is not limited to one look. Persona Pro is compatible with most major browsers, including Safari, Chrome, Firefox, Opera, and Internet Explorer (9/10/11+). Persona Pro allows you to upload your own logo image. The built-in code optimizes the logo to deliver the best resolution. How do I upload my logo? Tumblr is not limited to one page. You can create a whole new page, using the same layout of Persona Pro. Create a contact form, about, or any custom page. Tumblr's amazing font list provides basic fonts for every use. What fonts do your themes support? Say no-no to all the curly codes that make it look complicated. We made Persona Pro as customizable as possible with your bare hands. When I try to save this theme, Tumblr gives me an error message saying "Your Custom Theme references assets from non-HTTPS URLs. Please try again using only HTTPS URLs". Hello, I have a big problem please help me : the layout is not done well, the photo grid is not displayed. I yet "reset" before posting my pictures so I don't understand. Hello there! Thanks for letting us know this issue. This glitch was fixed on the previous version of Noir. You may need to update the theme to fix this glitch. It turns out the new plugin script blocked any asset file to load up on the browser. Thank you. Erica. Hi! Yesterday I bought your noir style. I dont have any problem with the installation but when I see my personal Tumblr on Mozilla Firefox or Google Chrome it doesn´t works http://albertopoloianez.tum.... On Safari I can see all ok .. I tried to delete cookies, other computers and nothing ..
Hello. 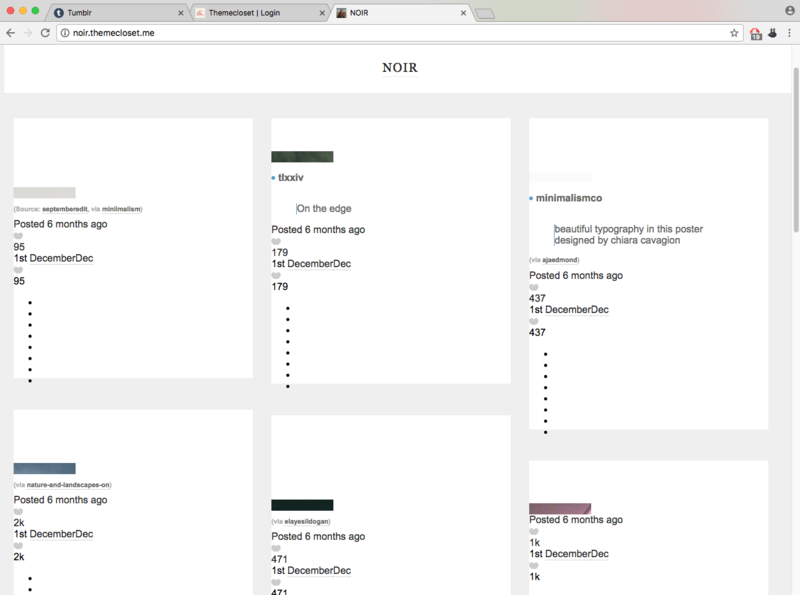 If you browse Noir's theme with Chrome or Vivaldi, the layout collapses. Safari is fine. 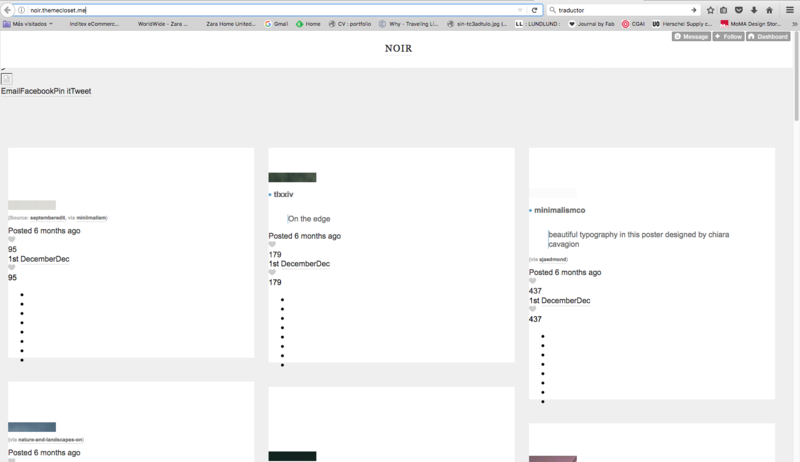 Not only my blog that I purchased and installed Noir, but also the demo page is collapsing. This seems not to be a problem of browser extension etc. Please check this. Hello, would you be able to look into the "One Column 400px" layout and determine why the content/posts aren't centered? The title appears to be centered but it looks wrong because the content/posts are slightly off to the right. For example, see davidnvisuals.ca to know what I'm talking about. Hello David, Looks like you left a comment too :) We just sent an email for your questions. Hope everything works out! is it possible to hide the caption on the home page, but show the caption on click? Ok, not cool. I just commented on Gretchen Two. I went back to this because it's the only one without issue... Now every photo is small. What is happening? Why is my Tumblr all sorts of messed up now? Hey Natde! We apologize for the reply. It looks like one issue that comes up when you skip resetting your blog. You may need to reset your blog first, and install the theme to avoid any issue. Most of the time, your previous theme affects the new settings. To prevent this, it's necessary to reset your blog first. Thank you for your interest in Noir theme. Here are frequently asked questions! Hope these help! Q: How do I remove 'install theme' button? Q: After I click 'Ask' button, it keeps saying 'There is nothing found'. How do I fix it? A: Enable the 'Let people ask' feature on Dashboard > Setting. Q: SCM Player does not work. How do I fix it? A: There is an input for SCM player code on the customize page. Put your code there. I purchased this theme before. How do I retrieve on my new account? What's the difference between theme licenses? How do I purchase this theme with my credit card? & I don't have a PayPal account. Let's talk here if you have any question! ©2018 Thingsneverchange Themecloset is not affiliated with Tumblr.